Universal and SonyBMG-backed Gbox has launched in the US. Aiming to rival Apple's iTunes Store, pricing is the same as on Apple's store. And what's more - the music has no DRM (Digital Rights Management) attached, meaning purchasers can use the files as they wish. Tracks are available for 99 cents (50p), but currently only US purchasers can take advantage of the service which enables you to download tracks in MP3, Windows Media or iTunes format. Gbox also has deals with Amazon and Google, as well as something called the Gbox Gifting Widget, a simple way for music labels to reach consumers via blogs and social networks. "The best way to reach consumers who are looking for content is to be where consumers naturally look," said Tammy Artim, head of Gbox. "There is no doubt that consumers go to their favourite search engines for discovery, and that's one of the key things Universal Music Group realised and is using for its MP3 trial. We believe the next frontier for discovery after the search engine is the social network, and that's what the Gbox Wishlist is designed for." Users can share their music wishlists with social networking buddies who can then send them the tracks as 'gifts'. In addition to providing users with a way to create a list of items they'd like to get, the wishlist also keeps track of the gifts you have given, and the gifts you receive. The 'gifter' can also leave comments and a link to their profile page so that the giftee can meet them and interact. "In recent months, we've seen strong uptake in widgets being added to our users' profile pages," said Greg Tseng, CEO of Tagged.com. "We offer a widget directory on our site with a selection of categories from photos to toys. 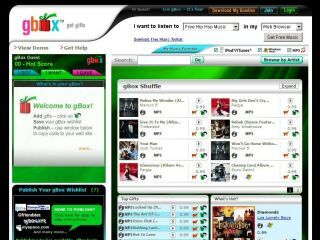 When we first saw the Gbox music wishlist we realised it would be a great addition to our site. Gbox takes gifting and music to the next level — it's a really good fit with how our social network community works."